If you have been paying attention to recent posts by Sweet Americana Sweethearts authors, you are aware there is something in the air. And I'm not talking about Birds In the Air, which is a well-known quilt block pattern. It involves quilts. It involves wedding quilts. It involves Grandma’s Wedding Quilts. Shhhh! It’s not up to me to tell her story. However, as the author of the book about Grandma’s oldest grandchild, Kizzie, I feel within my rights to give you a few hints. Grandma’s first name was Mary. She had three surnames during her lifetime. That must have been fun for future genealogists to find since two of the names she had before the wonderful 1850 census which was the first time the government called for enumerators to list everyone, male and female, who lived in a household. Good thing Grandma Mary left us some other clues. Grandma was born in 1805 and raised in Ohio. 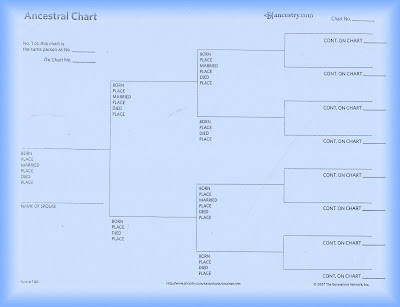 Those of you who do genealogy may recognize that Ohio during Colonial days was Indian Territory. It was definitely on the frontier west of civilization. 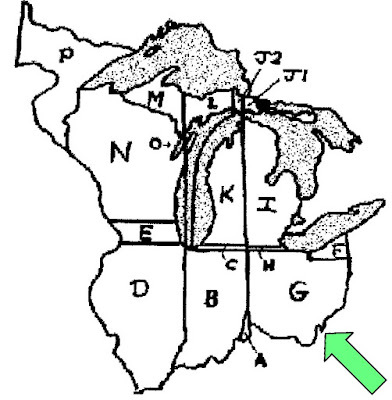 After the American Revolution, along with most of the Great Lakes region, it was designated as bounty land and used to pay soldiers who fought the war. In a country where money was scarce and land was plentiful, that is just how it was done in those days. 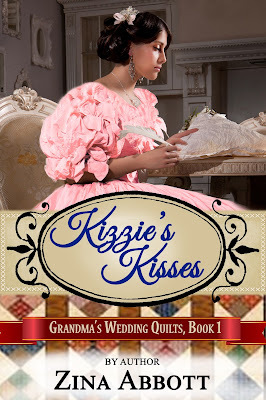 However, by the early 1860’s, the time in which her granddaughter I write about, Kizzie, was almost of age to marry, the Louisiana Territory had been purchased. 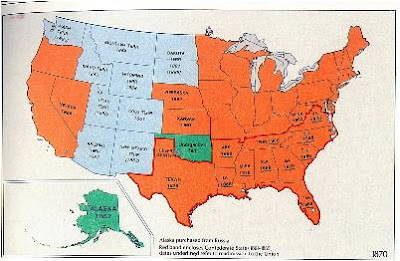 The war against Mexico had been won and a big section from that nation added to the United States. The question of who would own the Pacific Northwest had been settled. 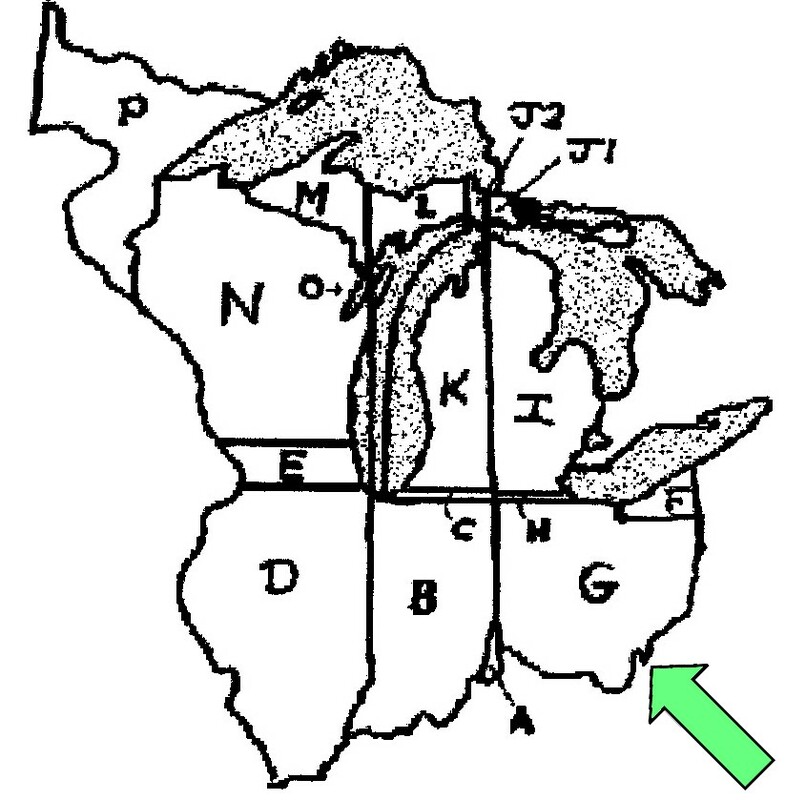 California and Oregon were states, and the land between them and the Mississippi River were territories. And, before the century was over, Grandma Mary’s children and grandchildren found themselves living from north to south, east to west. Some even spent some time right smack-dab in the middle—Kansas and Missouri. So, how does Grandma keep track of her far-flung family? 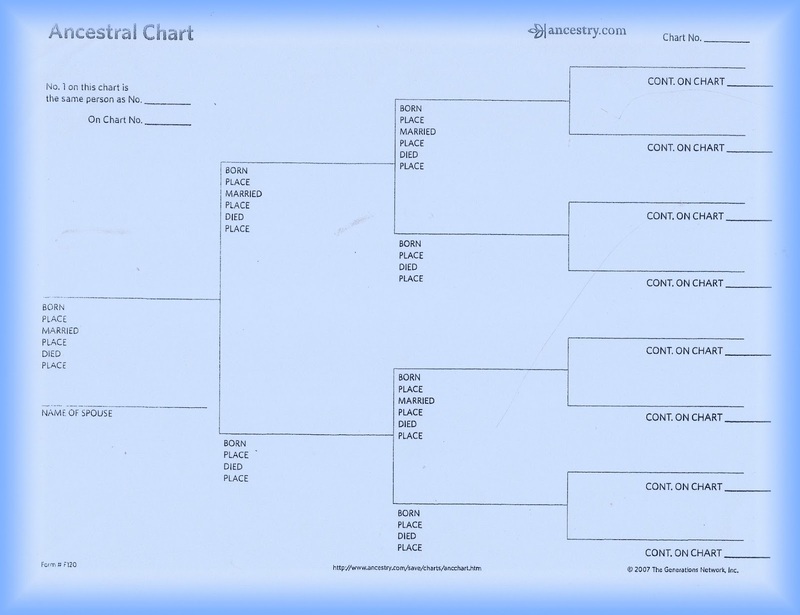 Genealogists know if they are lucky, to fill their pedigree charts, they may find their ancestors on the census and marriage records kept back in the day. Or on land records. If they are really lucky, they may find a family Bible with the family details listed. However, Grandma Mary used her talent for quilting to leave clues about her posterity. Perhaps when Grandma Mary started quilting, she used homespun. 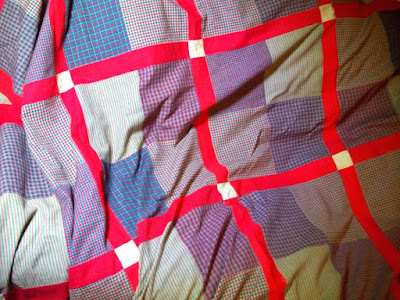 Above is a photo of an easy quilt out of green, red and tan homespun I am currently working on. Originally, homespun was, well—spun at home. Threads were created using a spinning wheel and then woven into fabric at home on a loom. In fact, although many people think of Civil War Confederate soldiers dressed in gray, reality was, many were dressed in butternut-colored uniforms made from homespun fabric woven and sewn by family members. By Civil War times, fabric was produced en masse back east in commercial fabric mills. The cotton threads were finer and the weave tighter. Detailed designs were often printed on the finished fabrics. 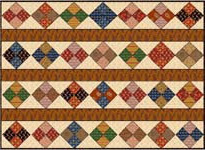 Since I am a retired rural letter carrier, one of my goals in life is to make a “Civil War Notes from Home” quilt such as the one above from Civil War Reproduction fabrics. In 1862 through 1865, the time period of Kizzie’s story, Grandma Mary would have had access to fabrics in these colors and designs. The following quilt design by Barbara Brackman of Civil War Quilts blog (used with permission) was included in my cover design. This four-square on point design was popular during the Civil War era. And, one last clue about Grandma Mary: Many quilts are made of blocks in all one pattern. Some are what are called a sampler quilt. 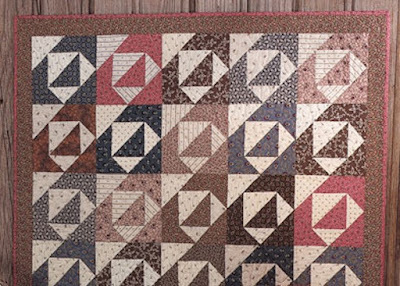 In other words, the colors may be the same, or at least coordinated, but each block design is different, An example is this modern sampler quilt by an unknown artist/quilter. 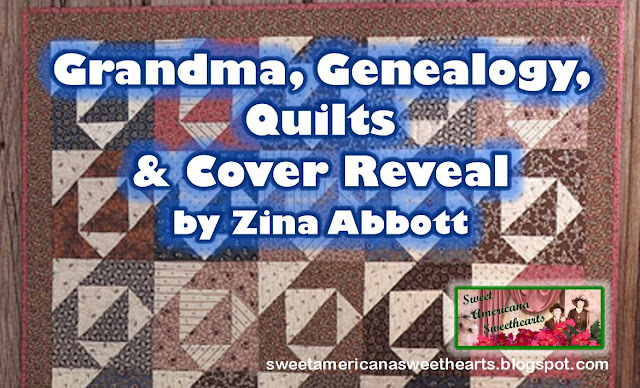 The stories of Grandma Mary’s Wedding Quilts involves a sampler quilt. And now—Ta! 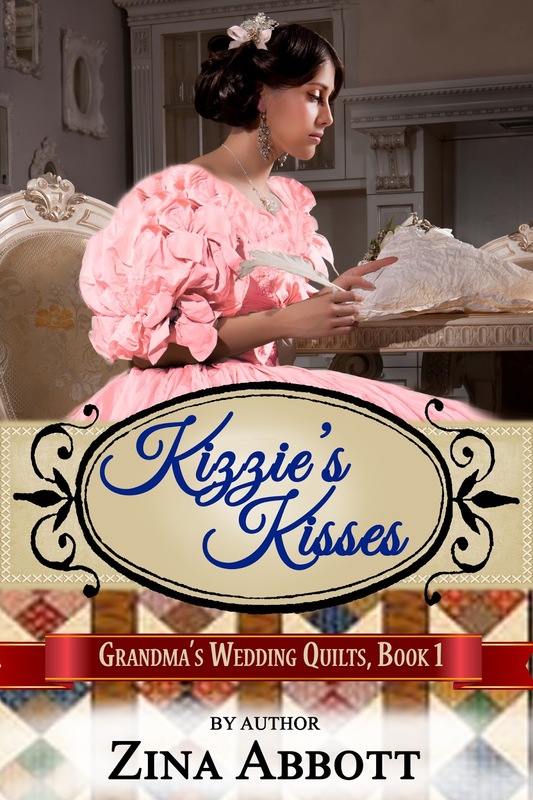 Da!—I present to you the cover of Kizzie’s Kisses about the oldest of Grandma Mary’s grandchildren. Fun Post, Zina! 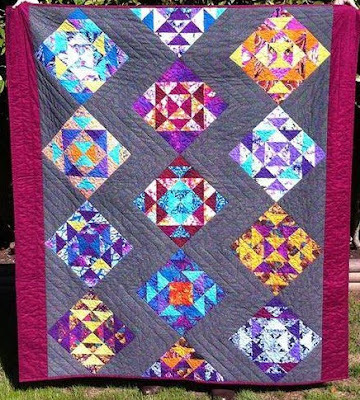 I would love to be able to take the time to quilt! It is on my bucket list. And your cover is stunning!